The terrace ... cosmopolitan elegance and stunning views of The Dubai Fountain. 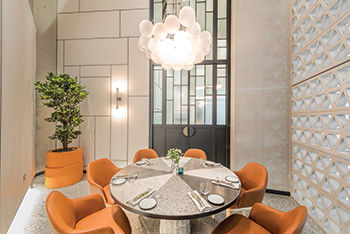 Designers of GIA Dubai restaurant have used references from Italy of the 1950s to create a casual atmosphere with Mediterranean hues. The latest Italian restaurant to open in Dubai, UAE, takes diners back in time to the south European country while offering them options as varied as dining under the stars or in a private dining room. GIA Dubai opened at the New Fashion Avenue in The Dubai Mall in late March. Set up jointly by Al Abbar Enterprises and franchise partner Ismaya Group, the restaurant combines the concept of good living (La Dolce Vita) with an authentic all-day dining Italian menu. “When we decided to bring GIA to life in Dubai, we wanted to serve guests with a truly genuine Italian experience, from the trattoria-style food to the stylish deco-inspired interiors, warmed by Mediterranean colour touches,” Tyrone Reid, CEO of Alabbar Enterprises, tells Gulf Construction. Hecker Guthrie, an award-winning interior designing firm from Australia, has used design references from Italy in the 1950s with a contemporary 21st century makeover to bring to life the concept for GIA Dubai. Murano-inspired glass screens sit around the kitchen creating a dramatic glow box. The chic restaurant can accommodate 135 diners, with an interior footprint of 3,961 sq ft and exterior footprint of 883 sq ft.
“To create a human scale to the vast space, the patterned cladding and lighting establish intimate surrounds with Murano-inspired dividing glass screens, giving each space a sense of enclosure, while eliminating spatial truncation through transparency,” Paul Hecker, a founding director of Hecker Guthrie, tells Gulf Construction. “Inspiration for the restaurant came from Italian 1950s films and architecture,” Hecker adds. From a design perspective, Hecker Guthrie has brought to GIA Dubai the “architecture within architecture” concept. 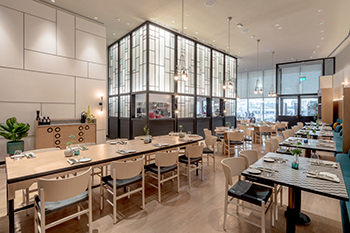 Murano-inspired dividing glass trattoria screens sit around the kitchen creating a dramatic glow box that also allows guests to see what their chefs are creating. These dividing glass screens give each space a sense of enclosure but with transparency. Hecker Guthrie took elements of the original GIA design in Jakarta, Indonesia, and translated them to the new location to create a more casual atmosphere that serves the clientele in the Dubai Mall. The simplicity of the monochromatic design contrasts with accents in warm Mediterranean hues. The cosmopolitan space flows effortlessly from the welcoming interior to a stunning alfresco terrace with unparalleled views of Dubai fountain. Airy bright whites and pops of light colours make the design of the dining room distinguishable, blending classy modernity with a twist of retro. The marble monolithic sculptured joinery grows out from the patterned stone floor and cocoons the guests. The restaurant’s bar is set within a white frame with geometrical concrete patterns that add urban expression to its light and airy space. A private dining room ... for those looking to celebrate special occasions in an exclusive setting. The lighting acts as a key element to the aesthetic, creating a dramatic overhead canopy. The statement light pieces accompanied by low-level mood lights seamlessly take the venue from day to night. “The canopy of lighting from Apparatus throughout gives a sense of drama, playing on the scale of the spaces and helps to establish the zoned areas,” says Hecker. Architects such as Gio Ponte as well as Carlo Scarpa were referenced within the flooring, furniture, patternation and architectural elements that were inserted and anchored into the new Dubai Mall, he adds. 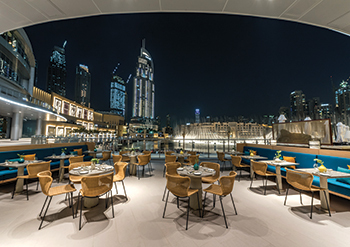 The terrace has cosmopolitan elegance and fantastic views of The Dubai Fountain, providing guests with a stylish, informal venue any time of the day or night. The venue also features an intimate private dining room for those looking to celebrate special occasions away from the spotlight in a more exclusive setting. The fit-out works were carried out by H2R Design, a multidisciplinary design agency specialising in F&B and hospitality. “We usually work from concept to completion, however, in this case we took the existing concept of GIA and developed it to be site-specific, working closely with Hecker Guthrie, the client and contractor (Metra), as the designers on the ground, to deliver the project that was on time, operational and true to the original concept while reflecting local culture, workmanship and material availability,” a spokesman of H2R Design says. The project work commenced in January 2017 and was completed in early 2018. “GIA transcends time and place and transports us to all things we love about Italian, a cinematic wonderland of crafted details, a Pandora’s box of masterfully curated spaces,” Hecker remarks. The Italian management of the restaurant infuses authenticity to the experience while ensuring service is personal and fuelled with excellence. The dining experience is complemented by a specially curated music collection with Italian flair. Despite its contemporary design, GIA’s focus remains firmly on traditional Italian ‘trattoria’ style recipes and presentation. Hand-picked ingredients of the finest quality bring a genuine, true Italian heritage and flavour to the menu, especially crafted for GIA Dubai by Tuscany’s own chef Tommaso Gonfiantini.